HDTV Supplys WolfPack innovative 5-Port HDMI Smart Box offers a simple solution to replace all the HDMI splitters, HDMI switches and HDMI Switch/Splitters you are using. Our 5-Port HDMI Smart Box can distribute HDMI signal bi-directionaly as each connector on the HDMI Smart Box combines input and output function. You only need to run one HDMI cable instead of two as other devices for installation, the input and output signal can pass through bi-directionally through this cable without any signal loss. This enables you a clean set up at less money. Our WolfPack 5-Port HDMI Smart Box senses whether the attached HDMI cable is coming from a source, like a cable box, as well as from a destination device like a TV (sink) and configures itself together with the remote control. The WolfPack 5-Port HDMI Switch Splitter can be used when you need any input to be sent to all outputs or any of the 3 combinations. All widescreens will have the same picture and audio. NOTE: These HDMI Switch Splitters are not an HDMI matrix switcher and all outputs show the same picture and are dependent of which one of the video inputs you have chosen. Why not buy this WolfPack HDMI 5-Port Smart Box today? Either an input and output signal can be transmitted through this single HDMI cable. When connecting to a display our HDMI Smart Box will identify the output signal and the output indicator will light up. Step 1: First select display input form 1, 2, 3, 4 or 5 on the remote control. Step 2: Press <- or -> to select the source. With the supplied IR extension cable you can put the unit out of sight such as hide it in a cabinet. Plug the 12VDC power supply into the unit and connect the AC adapter to AC outlet. Why not buy this WolfPack HDMI Smart Box today? Q: This WolfPack 5-Port HDMI Smart Box has CEC, what is CEC? A: This HDMI Smart Box features CEC (Consumer Electronics Control) allowing your HDTV's remote to manage up to ten devices that are connected via HDMI (such as Blu-ray Disc players or home theater receivers) with no special programming needed. For example, you can use your remote to turn on your TV, your player, and your receiver at the same time, and adjust the system volume with one button. All devices must support CEC, though. HDTV Supply includes a 1 Year Limited Warranty on this WolfPack 5-Port HDMI Smart Box. The warranty states that (a) its products (the Product) will perform substantially in accordance with the accompanying written materials for a period of 1 year from the date of receipt and (b) that the Product will be free from defects in materials & workmanship under normal use & service for a period of 1 year. In order to get a warranty replacement for a defective item, HDTV Supplys Support Team will verify the product is eligible for warranty. An RMA number will then be issued. Shipped replacements will be in like new conditions, tested and all components included. 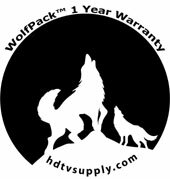 HDTV Supply also sells a 3 and 5 Year Extended Warranty for this WolfPack HDMI Smart Box. Please go to Extended Warranties or see the above Options to purchase it. Why not buy one of HDTV Supplys WolfPack product today?